An Introduction to Seismology, Earthquakes and Earth Structures is an introduction to seismology and its role in the earth sciences, and is written for advanced undergraduate and beginning graduate students. The fundamentals of seismic wave propagation are developed using a physical approach and then applied to show how refraction, reflection, and teleseismic techniques are used to study the structure and thus the composition and evolution of the earth. The book shows how seismic waves are used to study earthquakes and are integrated with other data to investigate the plate tectonic processes that cause earthquakes. Figures, examples, problems, and computer exercises teach students about seismology in a creative and intuitive manner. Necessary mathematical tools including vector and tensor analysis, matrix algebra, Fourier analysis, statistics of errors, signal processing, and data inversion are introduced with many relevant examples. The text also addresses the fundamentals of seismometry and applications of seismology to societal issues. Special attention is paid to help students visualize connections between different topics and view seismology as an integrated science. An Introduction to Seismology, Earthquakes, and Earth Structure gives an excellent overview for students of geophysics and tectonics, and provides a strong foundation for further studies in seismology. Multidisciplinary examples throughout the text - catering to students in varied disciplines (geology, mineralogy, petrology, physics, etc.). Most up to date book on the market - includes recent seismic events such as the 1999 Earthquakes in Turkey, Greece, and Taiwan). Chapter outlines - each chapter begins with an outline and a list of learning objectives to help students focus and study. Essential math review - an entire section reviews the essential math needed to understand seismology. This can be covered in class or left to students to review as needed. End of chapter problem sets - homework problems that cover the material presented in the chapter. Solutions to all odd numbered problem sets are listed in the back so that students can track their progress. Extensive References - classic references and more current references are listed at the end of each chapter. A set of instructor's resources containing downloadable versions of all the figures in the book, errata and answers to homework problems is available at: http://levee.wustl.edu/seismology/book/. Also available on this website are PowerPoint lecture slides corresponding to the first 5 chapters of the book. Seth Stein is Professor of Geological Sciences at Northwestern University. He has received the James B Macelwane Medal of the American Geophysical Union, been elected a Fellow of the American Geophysical Union and Geological Society of America, and named to the Institute for Scientific Information Highly Cited Researchers list. He served as Scientific Director of the University Navstar Consortium and on the Incorporated Research Institutions for Seismology's Executive Committee, and started Northwestern's Environmental Science program. Michael Wysession is an Associate Professor in the Department of Earth and Planetary Sciences at Washington University. He is the recipient of the Packard Foundation and NSF Presidential Faculty Fellowships for his research into the structure of the Earth's deep interior. 3 Seismology and Earth Structure. 5 Seismology and Plate Tectonics. Appendix: Mathematical and Computational Background. Solutions to selected odd-numbered problems. 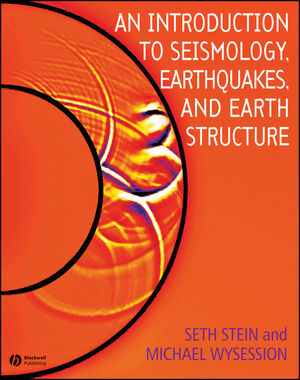 "An Introduction to Seismology, Earthquakes, and Earth Structure belongs on the shelf of every seismologist...a fantastic resource for interesting examples, challenging problems, added coverage for selected topics, and as a general reference resource. This book is destined to become a classic." "All in all, it is an indispensable reference for serious students of solid-Earth geophysics."